On Tuesday, the leaders of the U.S. intel community testified publicly before the Senate Intelligence Committee. Donald Trump didn’t like the truthful answers that his own handpicked people gave, so on Wednesday morning he viciously ripped into them on Twitter, undermining the entire intel community in the process, and coming across like a mentally unstable person. Senate Minority Leader Chuck Schumer has had enough. 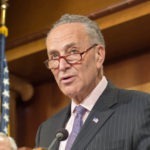 On Wednesday evening, Chuck Schumer announced that “It’s past time for U.S. Intelligence Community leaders to stage an intervention with Donald J. Trump.” He also posted a letter addressed to Director of National Intelligence Dan Coats, who oversees the entire U.S. intel community. This all seems obvious enough, but coming from the Senate Minority Leader, it’s stunning: he’s literally calling, in exact words, for U.S. intel leaders to stage an intervention with an out of control President of the United States. Palmer Report suggested earlier this evening that Senate Democrats were setting a trap for Trump, so he would attack the intel community and thus play himself for the fool.